Oak trees estimated to be 550 years old, a tallgrass prairie, woodlands and the scenic Sugar Creek beckon visitors. Although much of Sugarcreek’s 618 acres were once farmland, MetroParks land management practices, and natural processes, have resulted in a variety of habitats. These habitats support diverse wildlife that can be discovered as you hike, horseback ride, run the trails, exercise your pets or enjoy a leisurely picnic. If you’ve hiked in one of the MetroParks at dusk or at night, chances are you’ve heard the “Who cooks for you? Who cooks for you-all?” call of the barred owl. See if you can spot this forest resident roosting during the day on your next visit through the Osage orange tunnel at Sugarcreek MetroPark. This living tunnel was created by the large arching branches of old Osage orange trees. These trees were originally planted in rows in the late 1800s to serve as farm fence in the days before barbed wire was available. Hike the 1.3-mile Orange Trail to experience the tunnel in the evening hours, when you might be able to spot the owl. What do 550-year-old trees look like? Find out when you venture 0.7 miles along the Orange Trail to the site of the “Three Sisters,” three ancient white oak trees. Although in decline, two still survive. Borings from the trunk, done in the late 1960s on the largest of the three, indicate that they began growing around 1440. The largest of the three trees, dubbed the Big Sister, is one of the two largest trees in the MetroParks, with a circumference of 226 inches, a height of 141 feet and a crown spread of 93 feet, for a total of 390 points. Sadly, the middle sister, who had been weakened due to a fire, fell to the ground during the summer of 2008. She still lays between the other two soaring sisters, now a place for owls to nest, raccoons to sleep and bugs to eat. Discover the special plants of a tall grass prairie. These deep-rooted, sun-loving flowers and grasses range in height up to 10 feet and reach their flowering peak in mid- to late summer. This planted prairie whispers of an earlier time, before Ohio was settled, when more than 300 natural prairie openings existed and buffalo roamed the land. The sycamore is usually a tree of floodplains, stream-sides and moist banks. Here, however, sycamores are growing on a ridge. This suggests that a water source seeps beneath this ridge and provides the sycamores with adequate moisture. To recognize a sycamore, look for a tree with white bark on the upper portions. Sycamore Ridge is a good example of an esker, a long ridge of gravel and other sediment, typically having a winding course, deposited by meltwater from a retreating glacier or ice sheet. The native vegetation of the Sugarcreek area consisted of beech woods, mixed oak, sugar maple, elm and ash swamps along the creeks and flood plains. The park still contains several remnant beech from the native forest. Mature virgin specimens, some measuring up to 35 inches in diameter and probably 200 years old, are found in the east end of the park. There are several ADA parking sites at the Trail Center parking lot off of Conference Road. The restrooms at the trailhead are accessible. The drinking fountains at the main trailhead are new and accessible for wheelchair users. There is a level, paved path that begins at the parking lot, travels past the public restroom and the drinking fountain and makes a quarter-mile loop through the scenic prairie. A picnic shelter with an accessible table is also located just off of the path. Water is available seasonally at Oak Camp and the main park parking lot. Take Route 16 south through downtown Dayton to Wilmington Pike and Alex Bell Road. Walk south for about 1 mile on Wilmington Pike to the park. Caution: There are no sidewalks and traffic can be heavy. Route 23 also approaches the park. Vault-style restrooms are available at the main parking lot and at Oak Camp. A portable restroom is available at the horse trailer parking area. Although much of Sugarcreek’s 618 acres were once farmland, MetroParks’ land management practices over the last 50 years have resulted in a variety of habitats that support diverse wildlife. The park preserves both riparian and upland woodlands in a region of rapid economic and urban development. Visitors to the park can see impacts of the recent infestation of the emerald ash borer. A significant portion of the woodlands at Sugarcreek are composed of ash trees, all of which are likely to succumb to this predator. Reforestation and invasive species management are under way to ensure a continued healthy forest. Looks for the tubed baby trees as you park and enter through the trailhead. 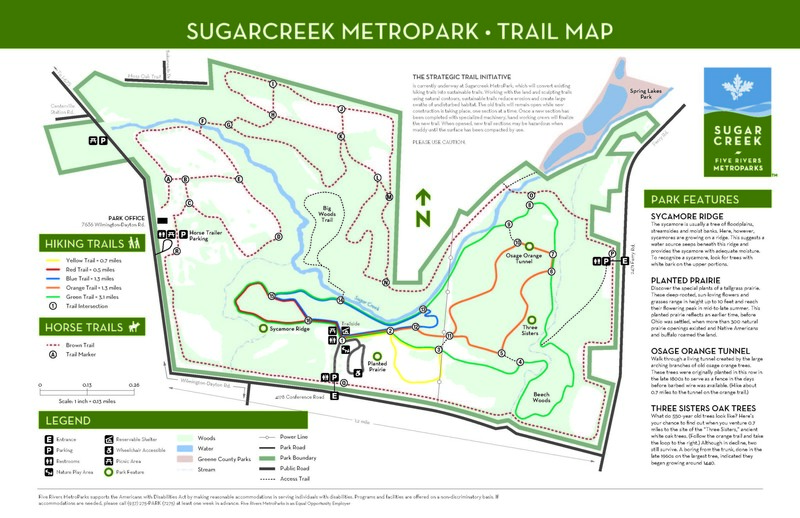 The strategic trail initiative is under way at Sugarcreek MetroPark, which will convert many of the existing hiking trails into sustainable trails. Working with the land and sculpting trails using natural contours, sustainable trails reduce erosion and create large swaths of undisturbed habitat. The old trails will remain open while new construction is taking place, one section at a time. Once a new section has been completed with specialized machinery, crews will handwork and finalize the new trail. New trail sections may be soft or uneven until the surface has been compacted by use. In spring, visitors to the park may see black smoke rising from the prairie. Controlled prairie burning is an important tool for managing prairie and early successional habitat. It releases nutrients and stimulates the growth of certain plant species. Bluebird boxes are scattered throughout the prairie. These boxes provide nesting opportunities for the cavity nesters who have been in decline due to dwindling habitat and competition for nest sites from house sparrows and European starlings. Volunteers monitor the boxes and clear them for up to three groups of fledglings each year. The park has 6 miles of wooded trails for trail running. They range from easy to strenuous and are open year-round. Steep trails are indicated on the trail map. Most trails are color coded and are marked by color coded posts. All colored trails are loops; follow the same color to arrive back at your starting point. Trail intersections are marked by numbers corresponding to the numbers on the map. Popular with trail runners, the 5K Green Trail loop at Sugarcreek provides fitness buffs a nature-filled experience for their workout. The trail travels up hills through wooded ravines, along the creek and next to 500 year-old oak trees. The strategic trail initiative is under way at Sugarcreek MetroPark, converting existing nature trails into sustainable trails. The old trails will remain open while new construction is taking place, one section at a time. New trail sections may be soft or uneven until the surface has been compacted by use. Thanks to a half-century of conservation practices, many of the habitat areas in and around Dayton have been restored and are thriving. Spotted salamanders are a great example of recent wildlife resurgence. Sugarcreek is the only MetroPark that contains spotted salamanders. These salamanders emerge to breed in the park’s vernal pool on warm rainy nights in the spring. The water in this vernal pool slowly drains through the ground during the spring season, leaving it completely dry by early to mid-summer. After their spring breeding, the salamanders live in underground burrows or rotting logs in the nearby forest. The vernal pool helps to protect the eggs and young salamanders, because fish species, who would feed on them, are not able to survive in the pool. You can visit a vernal pool by walking along the Orange or Green trail at Sugarcreek MetroPark. The pool is located just past the prairie, between the two trails. The Sugar Creek is home to rainbow darters, two-lined salamanders and long-tailed salamanders. Prairies are important habitats that Five Rivers MetroParks has been protecting and maintaining for 50 years. Visit Sugarcreek MetroPark and relax on the swing overlooking a huge prairie along the yellow trail and try to spot birds, chipmunks or other native creatures. The adjacent Spring Lakes Park habitat attracts birds such as barred owls and eastern screech owls, pileated woodpeckers and even black vultures, bald eagles and red-shouldered hawks. Venture 0.7 miles along the Orange Trail to the site of the “Three Sisters,” three ancient white oak trees. Although in decline, two still survive. Borings from the trunk, done in the late 1960s on the largest of the three, indicate that they began growing around 1440. The largest of the three trees, dubbed the Big Sister, is one of the two largest trees in the MetroParks, with a circumference of 226 inches, a height of 141 feet and a crown spread of 93 feet for a total of 390 points. Sadly, the middle sister, who had been who had been weakened due to a fire, fell to the ground during the summer of 2008. She still lays between the other two soaring sisters, now a place for owls to nest, raccoons to sleep and bugs to eat. The distinctive lay of the land that composes Sugarcreek MetroPark was shaped by the glacier that once covered much of Ohio. When the most recent glacier receded, about 12,000-15,000 years ago, the valley through which Sugar Creek flows was formed by the glacier’s melting ice. Many of the small round stones remaining from the stream beds of the glacial period form a narrow ridge, called an esker. Called Sycamore Ridge, the esker extends the length of the park. Walk through a living tunnel created by the large arching branches of old Osage orange trees. These trees were originally planted in rows in the late 1800s to serve as fence in the days before barbed wire was available. When the park district was formed in 1963, there was a need to find land to serve the fast-growing suburbs south of Dayton. The land for Sugarcreek MetroPark was acquired in October 1966 to meet that need. The park has 6 miles of wooded trails for walking and hiking. They range from easy to strenuous and are open year-round. Steep trails are indicated on the trail map. Most trails are color coded and are marked by color-coded posts. All colored trails are loops; follow the same color to arrive back at your starting point. Trail intersections are marked by numbers corresponding to the numbers on the map. The strategic trail initiative is currently under way at Sugarcreek MetroPark, converting many of the existing hiking trails into sustainable trails. The old trails will remain open while new construction is taking place, one section at a time. New trail sections may be soft or uneven until the surface has been compacted by use. The park has a quarter-mile paved path, which loops through the prairie for walking and running. Sugarcreek offers the longest and most challenging horse trails in the MetroParks. The trails include more than 8 miles of varied terrain, hills, open spaces, wooded areas and creek crossings. Interconnected loops allow for a variety of rides. Horse trailers can be parked and unloaded at the horse trailer lot, just south of the Park Office at 7700 Dayton Wilmington Pike. Water, picnic tables, grills and restrooms are available at the trailer lot and at Oak Camp, which is approximately 4 miles on-trail from the horse trailer lot. Sugarcreek MetroPark is a very diverse area with all stages of succession and mature forests and a trio of 550-year-old white oaks, varied topography, a planted prairie, meadows and the scenic Sugar Creek. The planted prairie provides a diverse mix of native prairie and old-field species but requires yearly burning or mowing due to the abundance of brambles and small trees. A large meadow as well as two pastures are located east of the horse trailer parking lot. The wealth of wildlife in the park also makes Sugarcreek a great place for nature study and birding. Cross the stepping stones over the creek to discover the Big Woods Trail, a quiet spot for nature observation. The trail follows along the creek corridor. Take a little time to sit and watch the water in the creek. In the elbows, the water is deep and clear, and you can watch the fish swimming. Fossils can be collected in the creek, near intersection #16 on the Green Trail. Collecting fossils is permitted only in the marked area. Follow the rules posted at the site. The nature play area at Sugarcreek borders a wooded area, encouraging kids to explore the play area and the woods around it. Enter from Conference Road and walk a short distance along the path to the trailheads. The paved prairie trail loop also offers a short walk for family exploration — perfect for baby strollers. Reserve the Trailside shelter for your exclusive use using our online reservation system. Portions of Sugarcreek MetroPark are great for cross country skiing in winter weather. Hiking trails are open all winter long in most MetroParks, including Sugarcreek. The 618-acre Sugarcreek MetroPark is filled with a diverse habitat of scenic creeks, rolling hills, dense woods, wildflowers, fields, prairies and wetlands, all conveniently located just south of Centerville/Kettering.